Spring 2010 Magazine: Conspiracy Theory or Fulfillment of Prophecy? Conspiracy Theory or Fulfillment of Prophecy? Today there are many people in the world and in religious bodies who use the term “conspiracy theory.” In fact, the word conspiracy is rarely seen separated from the word theory. Many times the phrase is valid. If you type that phrase into an Internet search engine, you will find things that are very improbable at best, and some items are even quite comical. These theories are often purported without one iota of documented evidence. But, does that mean that anytime we hear something out of the ordinary, we should automatically give it the ominous title of conspiracy theory? Webster’s New World Dictionary defines a theory as, “A speculative plan,” or, “a conjecture or guess.” We could, then, use the phrase “conspiracy guess.” But what if there was evidence supporting a conspiracy? What if the Bible speaks of such a conspiracy? What if the pen of Inspiration declares a conspiracy? What if official writings from international fraternities and organizations agree with Inspiration that indeed all the world will wonder after the Beast? Should we abandon such a striking fulfillment of prophecy as just another conspiracy theory? Today, there are some who strike hard against anyone who may be willing to expose these disturbing facts. I have found an interesting phenomenon take place with those who have not studied these matters for themselves. Often, they call anything that they have not heard before a conspiracy theory. And, by so doing, their ignorance concerning the fulfillment of prophecy is seen, while their artificial intellectualism is fed. The gospel of Christ had enabled its adherents to meet danger and endure suffering, undismayed by cold, hunger, toil, and poverty, to uphold the banner of truth in face of the rack, the dungeon, and the stake. To combat these forces, Jesuitism inspired its followers with a fanaticism that enabled them to endure like dangers, and to oppose to the power of truth all the weapons of deception. There was no crime too great for them to commit, no deception too base for them to practice, no disguise too difficult for them to assume. Vowed to perpetual poverty and humility, it was their studied aim to secure wealth and power, to be devoted to the overthrow of Protestantism, and the re-establishment of the papal supremacy. When appearing as members of their order, they wore a garb of sanctity, visiting prisons and hospitals, ministering to the sick and the poor, professing to have renounced the world, and bearing the sacred name of Jesus, who went about doing good. But under this blameless exterior the most criminal and deadly purposes were often concealed. It was a fundamental principle of the order that the end justifies the means. By this code, lying, theft, perjury, assassination, were not only pardonable but commendable, when they served the interests of the church. Under various disguises the Jesuits worked their way into offices of state, climbing up to be the counselors of kings, and shaping the policy of nations. They became servants to act as spies upon their masters. They established colleges for the sons of princes and nobles, and schools for the common people; and the children of Protestant parents were drawn into an observance of popish rites. All the outward pomp and display of the Romish worship was brought to bear to confuse the mind and dazzle and captivate the imagination, and thus the liberty for which the fathers had toiled and bled was betrayed by the sons. The Jesuits rapidly spread themselves over Europe, and wherever they went, there followed a revival of popery. To give them greater power, a bull was issued re-establishing the inquisition. Notwithstanding the general abhorrence with which it was regarded, even in Catholic countries, this terrible tribunal was again set up by popish rulers, and atrocities too terrible to bear the light of day were repeated in its secret dungeons. In many countries, thousands upon thousands of the very flower of the nation, the purest and noblest, the most intellectual and highly educated, pious and devoted pastors, industrious and patriotic citizens, brilliant scholars, talented artists, skillful artisans, were slain or forced to flee to other lands. Such were the means which Rome had invoked to quench the light of the Reformation, to withdraw from men the Bible, and to restore the ignorance and superstition of the Dark Ages (The Great Controversy, 234-235). And this is the religion which Protestants are beginning to look upon with so much favor, and which will eventually be united with Protestantism. This union will not, however, be effected by a change in Catholicism; for Rome never changes. She claims infallibility. It is Protestantism that will change. The adoption of liberal ideas on its part will bring it where it can clasp the hand of Catholicism. “The Bible, the Bible, is the foundation of our faith,” was the cry of Protestants in Luther’s time, while the Catholics cried, “The Fathers, custom, tradition.” Now many Protestants find it difficult to prove their doctrines from the Bible, and yet they have not the moral courage to accept the truth which involves a cross; therefore they are fast coming to the ground of Catholics, and, using the best arguments they have to evade the truth, cite the testimony of the Fathers, and the customs and precepts of men. Yes, the Protestants of the nineteenth century are fast approaching the Catholics in their infidelity concerning the Scriptures. But there is just as wide a gulf today between Rome and the Protestantism of Luther, Cranmer, Ridley, Hooper, and the noble army of martyrs, as there was when these men made the protest which gave them the name of Protestants (RH, June 1, 1886). 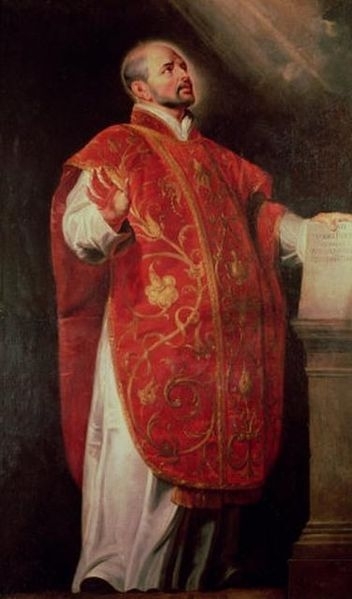 Founder of the Jesuits, St. Ignatius of Loyola. In every generation God has sent His servants to rebuke sin, both in the world and in the church. But the people desire smooth things spoken to them, and the pure, unvarnished truth is not acceptable. Many reformers, in entering upon their work, determined to exercise great prudence in attacking the sins of the church and the nation. They hoped, by the example of a pure Christian life, to lead the people back to the doctrines of the Bible. But the Spirit of God came upon them as it came upon Elijah, moving him to rebuke the sins of a wicked king and an apostate people; they could not refrain from preaching the plain utterances of the Bible—doctrines which they had been reluctant to present. They were impelled to zealously declare the truth and the danger which threatened souls. The words which the Lord gave them they uttered, fearless of consequences, and the people were compelled to hear the warning (The Great Controversy, 606). Thus the message of the third angel will be proclaimed. As the time comes for it to be given with greatest power, the Lord will work through humble instruments, leading the minds of those who consecrate themselves to His service. The laborers will be qualified rather by the unction of His Spirit than by the training of literary institutions. Men of faith and prayer will be constrained to go forth with holy zeal, declaring the words which God gives them. The sins of Babylon will be laid open. The fearful results of enforcing the observances of the church by civil authority, the inroads of spiritualism, the stealthy but rapid progress of the papal power—all will be unmasked. Thousands upon thousands will listen who have never heard words like these. In amazement they hear the testimony that Babylon is the church, fallen because of her errors and sins, because of her rejection of the truth sent to her from heaven. As the people go to their former teachers with the eager inquiry, Are these things so? the ministers present fables, prophesy smooth things, to soothe their fears and quiet the awakened conscience. But since many refuse to be satisfied with the mere authority of men and demand a plain “Thus saith the Lord,” the popular ministry, like the Pharisees of old, filled with anger as their authority is questioned, will denounce the message as of Satan and stir up the sin-loving multitudes to revile and persecute those who proclaim it (The Great Controversy, 607, emphasis added). Wow! I am more excited than ever to be living in these last hours of our world. Jesus is coming soon. It is a privilege to see prophecy being fulfilled. Then stood there up one in the council, a Pharisee, named Gamaliel, a doctor of the law, had in reputation among all the people, and commanded to put the apostles forth a little space; And said unto them, Ye men of Israel, take heed to yourselves what ye intend to do as touching these men. For before these days rose up Theudas, boasting himself to be somebody; to whom a number of men, about four hundred, joined themselves: who was slain; and all, as many as obeyed him, were scattered, and brought to nought. After this man rose up Judas of Galilee in the days of the taxing, and drew away much people after him: he also perished; and all, even as many as obeyed him, were dispersed. And now I say unto you, Refrain from these men, and let them alone: for if this counsel or this work be of men, it will come to nought: But if it be of God, ye cannot overthrow it; lest haply ye be found even to fight against God. This is the bottom line: if all the talk about secret societies and the Jesuits and the role in which they play is all conjecture, if it is all hogwash, then it will collapse. But, if it is true, it will lead thousands to the realization that the world is a giant labyrinth of deception. At one time, I was a total atheist. I thought Christians were narrow-minded bigots who needed some sort of comfort before their death. But, through the providential leadings of the Holy Spirit, I learned that there are secret societies, there is a devil, and therefore there must be a God. And I was led to the foot of the cross—to Jesus, who loved me and gave Himself for me even while I was a sinner. I recognized that Jesus Christ is the only hope for humanity. This is why it saddens my heart that some are very quick to dismiss as a heretic anyone who uses the terms Illuminati, New World Order, and the Jesuits. There are many conspiracy theories blowing in the wind, with no evidence to support them. There is, however, a documented conspiracy taking place against the Reformation. Let us be very careful not to hastily dismiss everything we hear as a conspiracy theory without first looking through the lenses of the Bible and the Spirit of Prophecy. If a conspiracy fails against the test of God’s Word, it should be rejected. But if it passes the test, however unpopular it may be, it is truth for this time, and a fulfillment of prophecy.